If you host Redmine on an internal server, the integration is done likewise. Our server doesn’t need to access your bug tracker server and you don’t need to change anything in your security or firewall configuration to make it work. 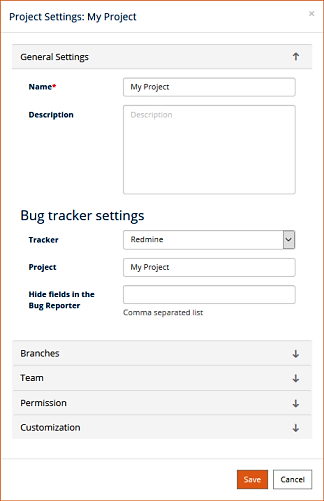 Choose Redmine from the Select a bug tracker combo box. You may click the Submit a sample defect report button to make sure Testuff can create bug reports in Redmine. If all goes well the new bug report should be displayed. Under General Settings section, make sure the Tracker field is set for Redmine and fill in the Redmine project for this Testuff project.